Photo Galleries Information about Joining Rotarians visiting to 'make up'. How do we give service? Like to be kept informed? Ian is Chairman of The Literacy in a Box Trust. He told us all about it on Wednesday 21st November and we had hoped to have a video of his presentation however it turned out to be so heavily pixellated as to be unusable. We, in the UK, take for granted school supplies, which include pens, pencils, paper, chalks and rulers among many others. However, the lack of them for most Zambian children, due to the inability of their parents to pay for them, is critical in the failure of many to have a full education. The Trust therefore decided that its first priority must be to focus on school supplies in its School Aid 4 Zambia programme. Knowing now what we could do to help, we had to consider how to achieve it but looked no further than Shelter Box for inspiration. If this box could transport relief items for communities in the wake of a disaster, surely a similar box could be used to transport school supplies to Zambia. The people at Shelter Box were very helpful and as a result of discussions with them we were given a couple of boxes for the pilot project - Literacy in a Box had begun. We were fortunate to be able to form a partnership with Operation Sunshine, a local charity that sends clothing and essential domestic goods to communities in Zambia and Tanzania. We made contact with various Schools in the communities in which Operation Sunshine work to ensure we had an exact list of materials needed by the schools and set about sourcing them. We rented space on their January 2006 container to Zambia and in April 2006 the first two Literacy Boxes arrived in Zambia. Each box contained enough supplies for 50 pupils. One box was sent to a 'basic' state school, the other to a community school funded from charitable resources. An e-mail received from the Head Teacher of the community school confirmed that the content of the boxes were exactly as needed, enabling the pupils to develop the core skills needed to become Literate and Numerate. She talks of the children she has rescued from street life and goes on to say that "their lives changed because of education" and that "you cannot go wrong in what you are trying to do". From these small beginnings we have grown in both size and scope. We have shipped boxes to Zimbabwe and the Philippines and boxes have been flown to Ghana and Nepal. However the provision of Literacy Boxes to Zambian schools remains the main focus of our operations. We realized that the original boxes were too large and expensive so we have now settled on a box which contains basic schools materials for 25 pupils at a cost of £295(£325 from 31st March 2016) including shipping. It would take 800 Literacy boxes a year to keep the 24 or so schools with which are currently involved adequately supplied with basic school materials. 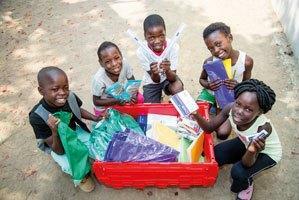 It would take around 250,000 Literacy Boxes a year to give every Zambian child the basic materials just ONCE. Literacy in a Box is now supported by many Rotary and Inner Wheel Clubs and schools across the UK. Schools are adopting the Literacy in a Box Trust, not only as a charity in its own right, but also as a catalyst to help deliver the curriculum in Global Citizenship and Understanding an Overseas Culture and we are receiving a lot of support from RotaKids and Interact Clubs. Our Facebook page and Newsletters contains many reports about what schools are doing for us around the country.